This joint Crann/Coillte event to celebrate Oak Glen’s ‘Coming of Age’ (nominal end of planting 1992), took place at the Oak Glen site on Sunday 25th August 2013. This Family Day celebration was officiated by Paddy Woodworth, with a tree planting ceremony. We had great weather for the event and people enjoyed their picnics and a lovely day in the woods. The children (and the adults) enjoyed meeting Dale Treadwell, Albie’s Nature Expert on “The Why Guy” RTE jr children’s show, with all his wonderfull bugs and beasties, not to mention his best friend and star of the show Scrappy aka ‘Harry the Hedgehog’. We hope that people will continue to enjoy this wonderful woodland and get outdoors and explore, it’s ours to enjoy and it’s free. Background: OAK GLEN is a joint project between Coillte and Crann to recreate an oak forest park in the area of Glencree where there was a Royal forest park in the 13th century. In 1990 the project was launched by Taoiseach Charles Haughey with the first tree being planted by President Mary Robinson and Bob Geldof planted the final oak in phase one the following year. Coillte undertook to manage the plantation, with sponsors and the general public having access rights under Coillte’s Open Forest policy. Initial establishment costs were largely funded through sponsorship by many thousands of people of about 120,000 oak trees. These sponsors ‘invested’ through grid referenced certificates in groups of five young trees of which one, on average, would develop to maturity after thinning. 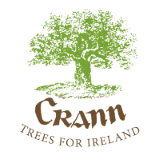 It is planned to transfer the grid referencing to a GPS based grid which can be accessed through the Crann website – www.crann.ie – or directly through a smart phone link. Location & Directions: Oak Glen – Cloon carpark – approximately 6.5 km west of Enniskerry on a 3rd class road to Glencree. Entering into Enniskerry village from the R117 (the twisty road from the N11) go to the right of the clock tower, and go straight on uphill and straight over a crossroads signposted for Glencree & also Oak Glen that has a fruit & veg shop on the left. Continue for about 6km until you reach the Cloon-Oak Glen car park. Note: If you find yourself at the entrance to Powerscourt, you are on the wrong road and must go back to the village centre to find the road to Glencree!